Southern Knights Atlanta this weekend! If you are in the Atlanta area this weekend, be sure to stop by Southern Knights Atlanta, which runs both Friday and Saturday. Join Rebecca Holden, Michael Scheffe, Ed Crick, Ron Martinez, countless replicas, props and fans as they join together to celebrate the 30th anniversary of Knight Rider! Membership is required to enter, but you can purchase tickets at the door. For more information visit their website at http://www.southernknightsatlanta.com/ or their Facebook group. Check out pictures from last years event so you can see some of the fun in store! 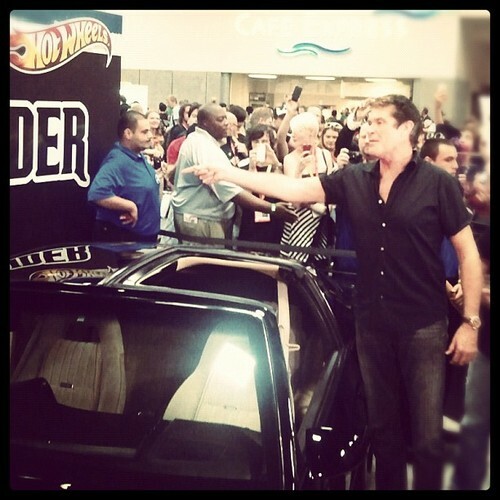 David Hasselhoff hits San Diego Comic Con 2012, visits fans and KITT! To help promote Hot Wheels upcoming Knight Rider products, David Hasselhoff appeared at the San Diego Comic Con on Friday to mingle and sign autographs for the fans. "The 404" from c|net was there and filed this report. Check it out and hear a bit from David on his thoughts on Knight Rider and of course his hopes for a feature film. Some fun thinking on what the next KITT might have! Check out below for some pictures from the day's event as well as some video of KITT during the preview night on Thursday. Officially kicking off today (though they had their preview night last night) this years San Diego Comic Con will have some fun things to check out for fans of Knight Rider, with both Hot Wheels and Diamond Select Toys showcasing Knight Rider goodies. *UPDATE* Confirmed by MattyCollector : "David Hasselhof AKA "Michael Knight" will be on hand Friday in celebration of the popular 80's TV show KNIGHT RIDER and the Hot Wheels K.I.T.T. Knight Industries Two Thousand car Friday from 2:30 to 4:30pm at the Mattel Booth #3029. 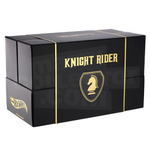 Over at the Diamond Select booth (#2607), who have spent this year releasing both Knight Rider figures/vehicles for their Minimates line as well as KNIGHT license plates, will have prototypes of their upcoming future releases for Knight Rider. 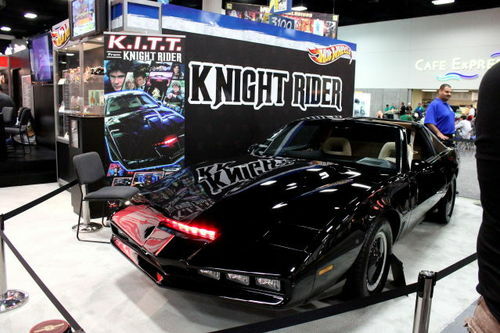 They too will have a KITT on display outside the convention center, so be sure to be on the lookout! Be sure to let us know what cool things you find on the floor, we promise to do the same! Knight Rider Festival IV has come and gone, and it's taken us some time to recover! This time for it's fourth year, it paired up with Las Vegas Car Starts to make it a memorable event. Peter Parros, RC3, joined us for his first US based show - having not aged a day - was very approachable and genuine. Bob Bralver, 2nd unit director and Director for 4 episodes of the original series had endless amazing stories to tell. They were joined by the beautiful Rebecca Holden, Michael Scheffe, Jack Gill, Buzz Bundy, Dennis Braid, and James Winburn. Representing Car Stars was was John Schneider, Erik Estrada, Paul Michael Glaser, Claudia Wells, Antonio Fargas and dozens of others (view list), all gathering together to make a difference for Children's Miracle Network. Congrats to Paul for another great event, and we'll see you next year! For more pics be sure to check out our gallery, and view YouTube for our latest videos, including some 3D footage! With the countdown to this years San Diego Comic Con underway, Mattel has begun to reveal this years exclusives. 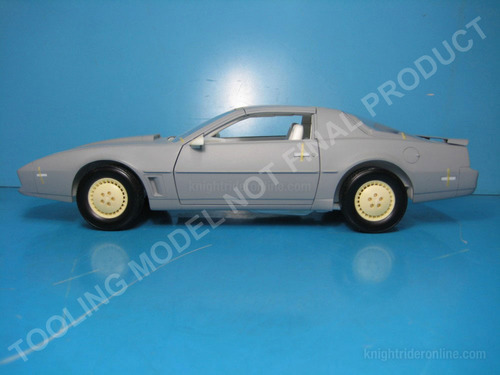 And while they don't have any picture available yet - they have confirmed via their Matty Collector website, that there will be a Hot Wheels® K.I.T.T. Knight Industries Two Thousand exclusive available at the show and limited run afterwards. We're of couse in touch with them, and will keep you updated as more information gets revealed. Diamond Select Toys has been having a banner year for the Knight Rider fans, first with the release of their Minimate series, then the KITT license plates, and now this. Coming this fall, we'll see the release of a 1:15 KITT, complete with doors that open (and fit a 3 3/4" figure), and electric lights and sounds. As far as we know right now there will be two variants. 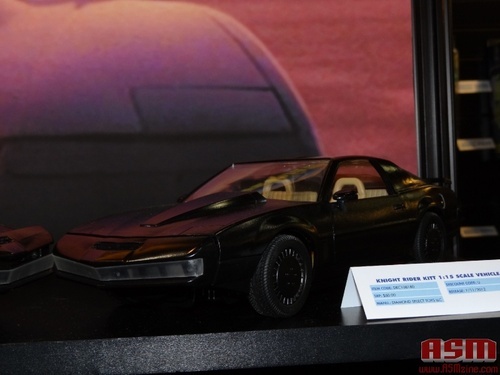 The standard KITT only will be available this October, while a variant with Michael Knight action figure will be available in January. You can pre-order the KITT version from these retailers for $50.00 on average. 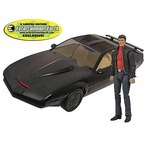 The Michael Knight one from Entertainment Earth for $59.99. We'll have more info in the weeks ahead, including a look at the electronics and interior! Looking forward to seeing what Diamond Select cooks up next! Be sure to have your DVRs set this week, as the voice of our good pal KITT makes an appearance on Grey's Anatomy! 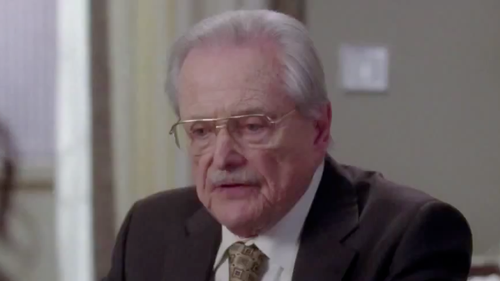 William Daniels, who just celebrated his 85th birthday last month, will be playing the proctor as the shows residents take their medical exams. Be sure to watch the preview for this weeks episode to catch an early glipse. Grey's Anatomy airs this Thursday at 9/8c. Exclusive! 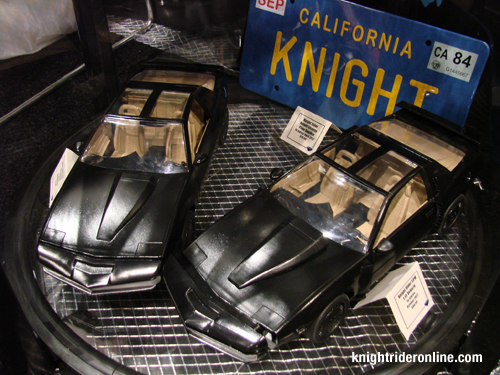 A look at Hot Wheels Elite 1:18 Scale Knight Rider KITT! We were recently lucky to catch up with the team behind the upcoming 1/18 diecast of KITT, from Hot Wheels Elite! They say KITT is doing well, and provided us these images of the latest KITT tooling model that they just received from their engineers. Note that these images aren't a final product, but rather a work in progress as they constantly refine to get a perfect accurate model. Opening engine hood- reveals the "Knight Industries turbo jet engine with modified afterburners"
Pretty beautiful stuff so far, can't wait to see how it turns out! It's currently scheduled for release in the last quarter of 2012. Countdown has begun for Knight Rider Festival! The Knight Rider Festival is just over a month away celebrating the 30th Anniversary of Knight Rider! It is taking place on May 18th and 19th in Fremont Street, Las Vegas. Now in it's fourth year, the Festival's primary mission is to be a free event for the fans to benefit the Children's Miracle Network and make a difference in a child's life. 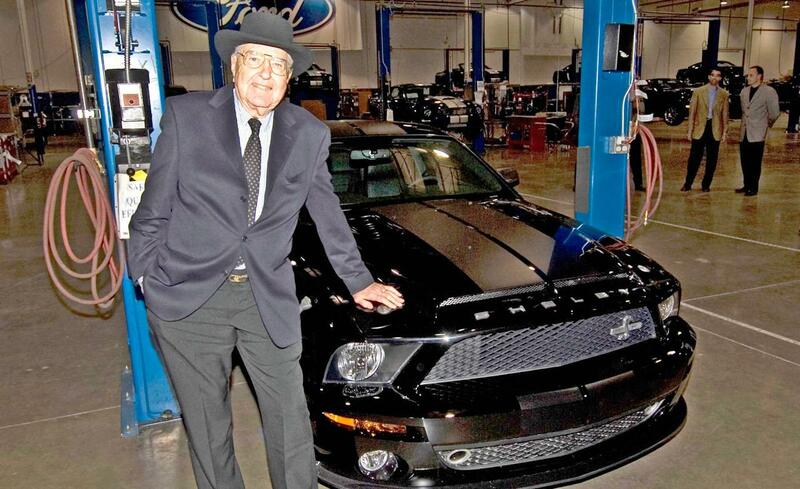 This year, producer Paul Casey has combined Knight Rider Festival with Las Vegas Car Stars, to create a colossal event with an amazing assortment of both stars and cars. Be sure to check out the special guests for the latest agreed stars - new surprises being added every day! If you are a replica car owner or even a classic car owner, you still have time to register, so be sure to sign up and not miss out on all the fun stuff in store. Discounted rooms are still available, however staying on property this year does not get you into the VIP party, that is a separate fee - which is more flexible allowing everyone to experience the festival the way they want to. We'll be there live covering it again, and can't wait to meet some new faces and see some old friends! 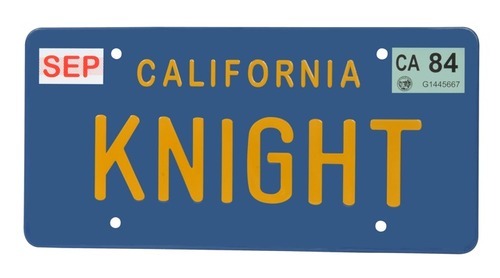 "KNIGHT" License Plate Now Available at a Comic Store Near You! 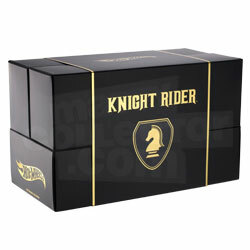 The first officially licensed replica "KNIGHT" plate, is now available from Diamond Select Toys! Printed on sheet metal, and then pressed to achieve the classic plate feel - it's the perfect signature piece for either the Knight Rider Festival coming up in May or the Southern Knights Atlanta in July. Retails for $35. This is the third product release this year, they also do the Minimates line which we reviewed back in Janurary. Coming in May is the release of the Toys R Us version of the Minimates KITT (with red shirt Michael and classic KITT mode). And be sure to be on the look out in Previews for the latest on the electronic KITT, with retailer exclusive version. Toy Fair 2012 is going on this week in New York City, and Diamond Select Toys - the company behind the awesome Minimates - took the opportunity to show an updated 1:15 KITT and SPM KITT. With the press portion beginning today, we are beginning to see some photos of their booth containing these models. These aren't the final models, so obvious defects remain - however they are more further along than what we were last seen at SDCC. Also check out the license plates for KARR and KITT, a nice collectable for many fans. Enjoy! 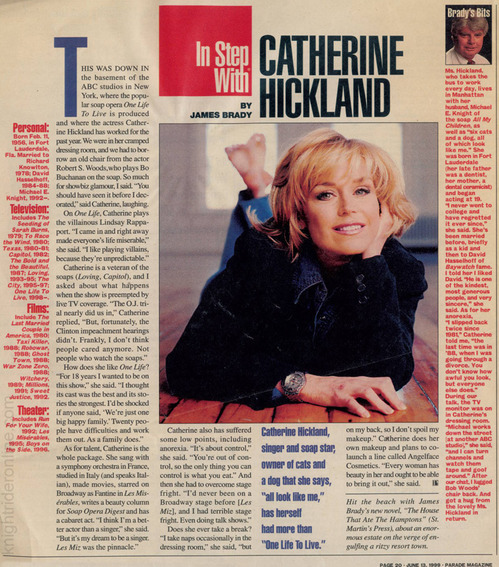 Happy Birthday to Catherine Hickland! Catherine played Michael Knight's fiancee and (short-lived) wife Stevie in three of Knight Rider fans' favorite episodes. She was also married in real life to David Hasselhoff. In recent years she has become a tremendous friend to the Knight Rider fandom, and even has her own KITT replica. She is a big supporter of the Knight RIder Festival in her home town of Las Vegas. Here's a bio of her as published in Parade Magazine back in 1999. She currently hosts a comedy-hypnosis show in Las Vegas. Hot Wheels Elite Knight Rider KITT coming this year in 1:18 and 1:43 scales! It had been rumored for more than a year that Hot Wheels would be doing the Elite treatment for Knight Rider. Today we have our first official confirmation from the Nuremberg Toy Fair that things are moving along nicely, with a hopeful 2012 release. 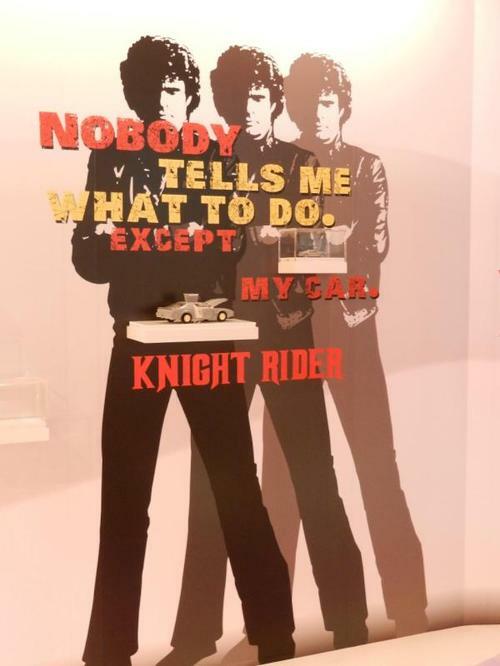 It started with the HotwheelsElite twitter account teasing us with a view of a tall poster with Michael Knight and the phrase "Nobody Tells Me What To Do. Except My Car." with two display cases with silver KITTs inside. Thankfully the site toycollector.com got a much closer look, and we get our first up close peak at these models. The models shown here are tooling models, but the attention to detail so far looks amazing! Can't wait to get our hands on these. In addition to these two Elite models, we've been told that there will also be a 1:64th scale KITT for the 2012 Hot Wheels First Editions line. No specific release date or pricing has been released, however Hot Wheels Elite is saying that both the 1:18 and the 1:43 will be limited to 10,000 pieces.